Distracted and drowsy driving creates risk for drivers as well as fleets, but various forms of technology can alert drivers to these hazards and enable fleets to tailor training to prevent future events. Hirschbach Motor Lines, a carrier based in Dubuque, Iowa, uses camera technology and alarms from Lytx Inc. to help prevent fatigued driving. Brian Kohlwes, Hirschbach’s vice president of risk management, said the com­pany has seen a dramatic reduction in major accidents since implementing the system. “There is not a doubt in my mind that this technology saves lives and gets people home to their loved ones,” Kohlwes said. Hirschbach ranks No. 87 on the Transport Topics Top 100 list of the largest for-hire carriers in North America. With Lytx, drivers receive an audible warning based on driving events such as weaving. If the event recurs, drivers get another audible warning. The third time, it activates the camera and saves 8 seconds before and 4 seconds after the event so Hirschbach can review the videos. “If we see someone with fatigue issues, we get them shut down right away and try to correct that behavior,” Kohlwes said. For Donald Henderson, director of ­safety for Chicago-based All Truck Transport, it was essential to be able to add technology without adding staff. He invested in Lytx and found that mobile phone usage was a top concern with about 90% of trigger events being tied to phones. “It is one of the hardest things to manage no matter what size your fleet is,” he said. At All Truck Transport, drivers get an audible alert when they have less than 4 seconds of following distance and a solid tone when they are within a 1-second following distance. “If they make a correction, then I don’t get the video,” Henderson said. Another vendor, MiX Telematics, also uses warnings within the cab so drivers can self-correct, generating a buzz, single beep or continuous sound until the condition is remedied. “We’re there to drive you back into that conscious state,” said Adam Bruttell, vice president of North American sales for MiX Telematics. He added that MiX could give alerts during specific time periods based on a driver’s circadian rhythm. MiX’s onboard computer gives drivers feedback on safety issues, such as hard cornering, hard braking and hard acceleration, which could be caused by distracted or drowsy driving. “A lot of time, if drivers are distracted, they look up, and you’ll find hard braking quite a bit. You’ll also find that they switch lanes,” said Brian McCoy, vice president of Business Development Oil and Gas at MiX Telematics North America. With MiX Telematics, fleet managers can review video footage of events, such as speeding or hard braking, to coach drivers on their behavior, Bruttell said. Netradyne offers a different approach. The San Diego-based technology provider uses cameras to monitor drivers’ eye positioning, their horizontal and vertical head plane and yawns, which can identify drowsy or distracted driving, said Adam Kahn, Netradyne’s vice president of fleet business. If drivers appear to be drowsy, Netradyne creates an alert, such as a chime, aggressive buzz or seat rumble based on the severity and the number of instances. When monitoring eyes, Netradyne looks at blinking and elongated closures. Netradyne analyzes each driver’s facial movement to create custom solutions. “You want to start tracking the open-mouth activity of the driver. How much time is the driver’s mouth open or is the guy an open-mouth talker? That is divided by the total amount of time you saw these events,” Kahn said. Unlike camera technology, SmartCap aims to prevent drowsy driving with a head-worn band that measures brain waves and provides early warning alerts for fatigue and alarms to prevent incidents, said ­Conny Gustafsson, business development manager for North America at SmartCap Technologies. The Milton, Australia-based company displays fatigue scores calculated with proprietary algorithms that measure the risk of unintended sleep. Gustafsson said SmartCap empowers self-management, enabling drivers to make adjustments before external intervention is needed. However, if drivers enter into Level 4, they get a signal and have to touch the monitor, and SmartCap can alert someone who has access to the trucks. SmartDrive, a video and telematics provider based in San Diego, uses video-based safety technology, sensors and data to help fleets improve safety, Chief Operating Officer Jason Palmer said. The technology gives fleets a complete picture of what is distracting the driver, for how long and the increased risk caused by the distraction. As a result, fleets can provide detailed feedback, actionable coaching and training to improve driver safety, he said. With SmartDrive, fleets can get real-time e-mail alerts about specific critical safety events. If the technology captures an instance of distracted or drowsy driving, fleet managers receive the information and can address the issue before drivers further endanger themselves or others, Palmer said. Safety Vision, which provides mobile video surveillance, also utilizes e-mail, sending reports to fleet managers when certain parameters have been triggered. Events can include erratic driving, prolonged idle periods or off-route activity. “It is then at the discretion of the fleet manager to pass the message on to the ­driver if they wish to do so,” said Jamie Hawkins, a spokeswoman for Safety Vision. Safety Vision utilizes a multicamera system that offers fleet managers the ability to do a live look-in on the truck for monitoring or reviewing purposes. 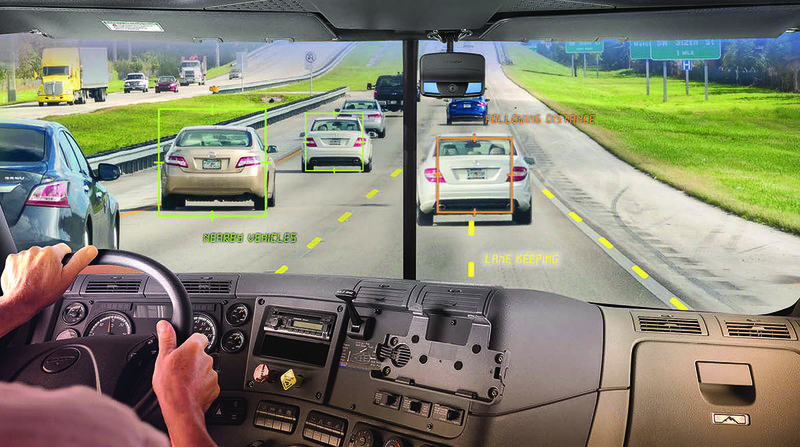 Drivers initially could be hesitant about the technology because they want to protect their privacy, “but over time, our systems prove to be much more beneficial than negative for the driver,” Hawkins said, adding that cameras can exonerate drivers in the event of a crash and save fleets millions of dollars in false claims. Jimmy Nevarez, president of Angus Transportation Inc. in Chino, Calif., utilizes ZED Connect, which he said helps manage drivers’ schedules and prevent fatigue and assists him in identifying where drivers are spending their time. “I can say ‘My drivers are tired because they’ve been sitting at your dock for four hours,’ ” he said. Carlton Bale, co-founder of ZED Connect, a software company focused on analytics, said the firm helps drivers and fleet managers identify risky situations, which could be caused by drowsy driving. Bale said it could be difficult to differentiate between external events and driver fatigue-related events, and that is where artificial intelligence and analytics come into play. “By studying a large data set that includes advanced driver-assistance systems events, we can identify locations, weather conditions, traffic flow conditions that frequently cause vehicle-control issues and separate those from driver fatigue-related situations,” Bale said. ZED Connect, a subsidiary of engine maker Cummins Inc., tailors information to each vehicle and driver, which creates specific insights. The company previously offered an electronic logging device but recently moved to discontinue that product. With all onboard monitoring systems, driver acceptance is central to the technology’s success. To get driver buy-in, Palmer said fleets need to explain what equipment is going into the cab, what events the video-based technology is recording and how it benefits drivers. SmartDrive offers training sessions for drivers and fleets to review the program and its features.